PVC Insulated and IS:694 Standard Electrolytic Grade copper having pure and maximum conductivity to ensure maximum safety. Bunching of copper in uniform lay & diameter, that makes stripping & crimping of wires easier & minimizes losses. Indigenously developed PVC compound formulated from finest ingredients and produced in-house. Double insulation, with primary insulation from virgin PVC, coated with ultra thin colour layer. Multi strand 100% Pure annealed Electrolytic copper conductor. FR/FR-LSH insulation conforms to IS:694/1990. Double insulation with ultra thin layer. Max. rated conductor Temperature: 70 degree C for General purpose insulation & 85 degree C for HR insulation. Max. temperature of conductor during short circuit: 160 degree C.
PVC insulation compound: Extruded Double layer PVC Type A/ FR/ HR/ FR-LSH. Primary Insulation: Natural PVC with FR Property, Secondary Insulation: Skin Colour with FR Properly coated PVC. Used in duct, conduit or Aerial wiring for electric power in Houses, Buildings, Flats, Apartments, Hospitals, Theaters, Education Institutions & Factories also used with UPS, Invertor, Battery, control panels etc. 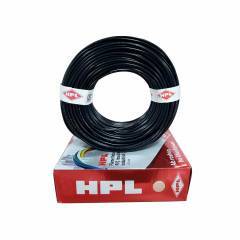 HPL 4 Sq mm Black Single Core Unsheathed Household Wire, Length: 200 m is a premium quality Low Tension Cables from HPL. Moglix is a well-known ecommerce platform for qualitative range of Low Tension Cables. All HPL 4 Sq mm Black Single Core Unsheathed Household Wire, Length: 200 m are manufactured by using quality assured material and advanced techniques, which make them up to the standard in this highly challenging field. The materials utilized to manufacture HPL 4 Sq mm Black Single Core Unsheathed Household Wire, Length: 200 m, are sourced from the most reliable and official Low Tension Cables vendors, chosen after performing detailed market surveys. Thus, HPL products are widely acknowledged in the market for their high quality. We are dedicatedly involved in providing an excellent quality array of HPL Low Tension Cables.